When small-town lawyer Bethany Barclay is framed for murder, she finds herself on the run and caught between two mysterious organizations plus the government’s own investigation. She quickly realizes her best friend Annabelle Seaver had been involved in something big–and upon Annabelle’s recent death, Bethany is the only one who can connect the pieces of the puzzle to discover what her friend was up to, and decide for herself if she wants any part in it. The narrative twists from dangerous men, through a religious cult, rumors of an ancient religious artifact, and a political and spiritual battle bigger than anyone could anticipate. 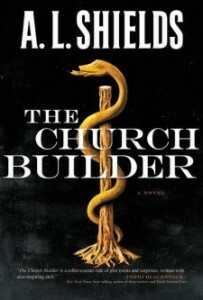 The Church Builder reads like a fast-paced blockbuster hit–in line with The Da Vinci Code or maybe a John Grisham novel. (I actually think it could be more successful as a movie than as a novel.) It is Christian fiction, and yet I do not know I would have recognized that if I were unfamiliar with the publishing company. The Christian themes are subtle even though faith in general is a large part of the book. Also, the writing has an abruptness to it that is more characteristic of secular popular fiction, and I mean that as a compliment: the story moved quickly, and reeled me in. I have enjoyed the characters and am interested to read the rest of the series as it becomes available. Your review sucked me in and once I was here, I was intrigued by your blog summary to address sticky issues in order to shake, focus and unite the church body. I can’t wait to read more.